In the mood for a little snacking make-believe? First, imagine what it’s like biting into a fresh, ripe strawberry. Now make it chewy, add in the flavors and natural nutrition of bright, earthy beets and sweet potatoes, and sprinkle in some crunch courtesy of organic chia seeds. Still with us? Good. 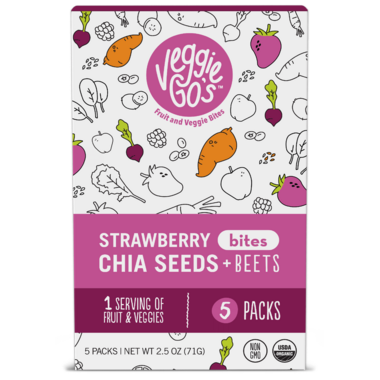 Now you can have it all for real with these Strawberry, Chia seeds + Beets Veggie-Go’s Bites. Every snack-ready pouch is loaded with the tastes, textures and temptation of organic fruit and veggies in a combination you can’t help but crave. Another excellent product from well.ca!. Both my daughter and I love these. Itâ€™s also super handy when youâ€™re on the move. My 4 & 2 year old love em! Grandchildren love these. A healthy snack. But I agree with previous reviews - a little pricey for the quantity you get! Taste good and not too sweet. My 1 Year old loves them and he can chew them pretty easily. Son loves them nice healthy snack. Just a little pricie for the amount you get. Similar to fruit leather but not sticky. I LOVE these!!!! These have the texture and firmness of fruit leather and are not super sweet. I like them for a healthy fruit snack.